40 years ago, mobile phones were still the stuff of speculation and science fiction. Today, there are almost five billion mobile phone subscriptions across the world. As a percentage of global population, this figure is around 70%. There is no other invention that can match the growth of the mobile phone. It has had astonishing success. And the technology behind it continues to move forward at a rapid rate. In recent years, the mobile phone has also led to a further development: the growth of apps. Inventors with an interest in technology are producing apps for mobile phones that perform a host of functions. They include games, business tools and guides to fitness and health. The Apple iPhone, to name just one mobile phone, has more than 250,000 apps available. But despite the dominance of the mobile phone in telecommunications, initial progress was slow. From the Second World War on, many inventors made attempts to create mobile phone devices and networks but hit one problem after another. Some of the phones were limited to vehicles, often because they were too heavy to carry around. Others could use only restricted networks centred on base stations and phone wires. 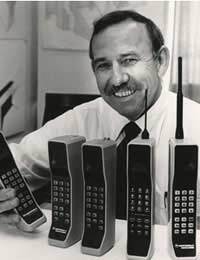 Then, during the 1970s and early 1980s, Motorola spent millions of pounds developing a hand-held, wireless phone. The company did manage to produce a usable mobile phone as early as 1973, but it needed a suitable network to be truly effective. Success finally came in 1983. This was the year in which the US Government gave its official seal of approval to the Motorola DynaTEC 8000X. Compared to modern mobile phones, the specifications of the DynaTEC 8000X weren’t impressive. It stored 30 phone numbers. It kept a charge for just eight hours. And the owner could talk on it for no more than 30 minutes before the battery ran out. It also cost around £3,000. Even so, the phone became immediately popular. On 1 January 1985, it arrived in Britain. City traders in particular saw the potential of the phones. They didn’t hesitate to buy them, despite network limitations. The Motorola 8000 series were rather ungainly-looking phones. They were about 13 inches long by 3.5 inches deep and 1.75 inches wide. Hence they acquired the nickname of “bricks”. But size didn’t dent the phone’s popularity. And before long, other companies entered the market. Competition came from Nokia, Technophone, NEC and BT. Technophone managed to shrink the size of the mobile phone to 7 inches high by 1 inch deep and 3 inches wide. But the price was £2,000. Alternative finance came in the form of leasing. It was possible to rent Technophone’s Pocketphone for a monthly payment of around £50. At this time, the main networks for mobile phone signals were Cellnet from BT, and Vodafone. Pocketphone users could change between the networks to find the clearest reception. There was no need to subscribe to one service. Consumer interest in mobile phones drove technology forward. Phone makers knew there was a huge market to exploit if they could make more portable, cheaper phones. The arrival of digital communication and text messaging in the early 1990s helped to promote mobile phones still further. Since then, mobile phones have become multimedia centres that send and receive emails, play videos and music, and connect to the Internet. Few other inventions have grabbed the imagination so fast and so comprehensively.